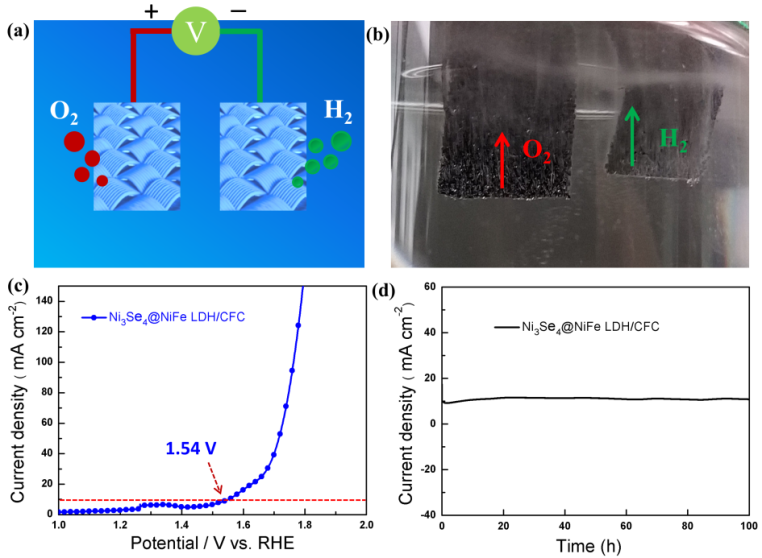 Chinese researchers have developed new hierarchical hetero-micro/nanosheets to enhance the durability and activity toward overall water splitting which is seen as a method to produce renewable energy by turning water into hydrogen and oxygen using electrolysis. The critical shortage of fossil energy and associated environmental crisis accelerate the development of renewable energies. Water splitting driven by electricity emerges as one of the most effective strategies for renewable energy production by converting electrical energy into chemical energy stored by hydrogen fuels. Currently, a great deal of effort has been devoted to develop cost-effective and earth-abundant replacements catalysts with high activity. Progress toward electrochemical water splitting electrocatalysts with high activity and superior durability faces significant challenges due to the destruction of crystal structure and inactivation of activity sites, especially under alkaline condition for industry application. If the differently functional electrocatalysts could be organized into hierarchical hetero- micro/nanomaterials, such novel structures will be endowed with abundant exposed edges and larger surface area, which offers more active sites for catalytic reactions. Moreover, the advanced hierarchical hetero-catalysts could possess superior electrocatalytic stability due to such hierarichal micro/nanostructures. Based on this new concept, the research team led by Prof. LI Yue in Institute of Solid State Physics (ISSP), Hefei Institutes of Physical Science assembled hydrogen evolution reaction (HER) active Ni3Se4 micro-sized sheets and OER active NiFe LDH nanosheets into hierarchical hetero-Ni3Se4@NiFe LDH electrocatalysts with a simple and scalable thermal treatment method. Benefiting from stability of the novel hierarchical hetero-micro/nanostructure and the strong electronic interaction between NiFe LDH and Ni3Se4, the hierarchical hetero-Ni3Se4@NiFe LDH catalysts were endowed with superior durability and high activity for water splitting. The team conduct this study with the hope to inspire further promising synthetic methodology for rational design of efficient bifunctional electrocatalysts toward overall water splitting. 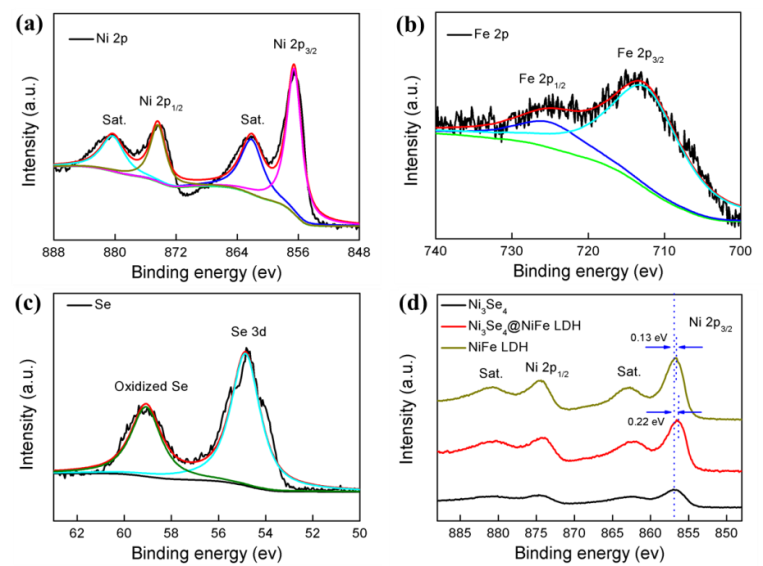 The findings have been published online in Nanoscale Horizons entitled Hierarchical Hetero-Ni3Se4@NiFe LDH Micro/nanosheets as Efficient Bifunctional Electrocatalysts with Superior Stability for Overall Water Splitting. This investigation was supported by the National Science Fund for Distinguished Young Scholars, the Natural Science Foundation of China, the Major Program of Development Foundation of Hefei Center for Physical Science and Technology and the Anhui Provincial Natural Science Foundation.